A Clevedon dairy property, combining outstanding location, contour and potential for diversification, is for sale for the first time in 44 years. 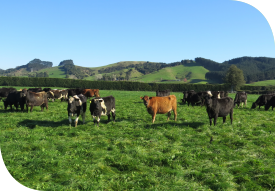 Located 32 kilometres southeast of the Auckland CBD, the 108 hectare farm is presently run with an adjoining 70 hectare lease block. John Sisley of PGG Wrightson Real Estate, Hamilton is marketing the farm. He describes it as a well-appointed, superior property offering multiple benefits. “Mainly flat, its diversification potential includes intensive horticulture, specialist horse training, and lifestyle and residential subdivision, all of which feature nearby. “From 170 hectares, including the lease block, 450 cows produced 168,079 kilograms of milksolids in the 2014/15 season. “Its consolidated peaty loam soils are covered in rye and white clover, while approximately 14 hectares is cropped in turnips and maize. Around 200 tonnes of grass silage is harvested annually,” he said. A 28-bail rotary milking shed features nine-year-old Waikato plant, Milfos cup removers, a colostrum vat used as an ice bank in the summer, and a 350-cow yard. Water supply is from two deep well bores; subdivision comprises two- and three-wire electric and hedges; and additional farm buildings include a combined workshop/woolshed, a four-bay half-round hay barn and sundry calf- rearing facilities. John Sisley says the main dwelling is a four-bedroom brick and weatherboard home. “Built in 1962, it is set in mature attractive grounds. A three-bedroom cottage relocated to the property in the 1960s, and a three-bedroom weatherboard home with a modernised kitchen and separate toilet and laundry complete the accommodation,” he said. For sale by tender, offers for the farm, which is in three titles, close at 4pm on Friday, 30 October.